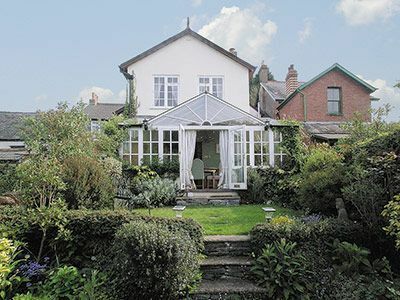 Teign Cottage is a four bedroom detached 200-year old cottage, which sleeps up to 9 people. It is located in the village of Combeteignhead, which is 2 miles from Shaldon and 5 miles from Teignmouth. The village is very pretty and there is a pub nearby, which dates back to the 1700s and serves up good food and ales. The house itself was the former bakery and is full of character and charm. There are many original features such as wooden fireplaces and beamed ceilings. The accommodation is spacious and decorated to a high standard. The living area consists of a large lounge which opens up to a conservatory on one side and the fully equipped kitchen/diner on the other. There are four bedrooms: three double and one twin. One of the bedrooms has a z-bed for a child. There is a family bathroom with roll top bath and an ensuite shower room off the master bedroom. Outside there is an enclosed garden consisting of a patio, lawn and shrubs, with has views across the countryside.